For most men, a pair of shoes goes a long way in their life. Not just because they last a long time, but also simply because a man typically only has a few pairs of shoes at any one time. Contrast that to women who have so many more pairs of shoes than men, and it is easy to see why the shoe selection of a man is so important. If you only have 3 or 4 pairs of shoes, you must make them count, and make sure that they cover a wide range of occasions. Although different men have different lifestyles, the below is a list of the 4 pairs of shoes just about every man should have in their wardrobe. There is obviously some room for debate and you can obviously own more than 4 pairs of shoes, but if you only could own 4 pairs, this is what we highly recommend owning. These are probably the first type of shoes you wore as a kid. The remarkable thing about these are that they are not only comfortable, but also socially acceptable in a wide variety of situations. Unless you are out and about in professional settings just about all the time, athletic-type shoes would be your go shoe of choice, going especially well with jeans or shorts. Athletic shoes are great for exercising, and can be worn in most casual settings. And obviously these shoes are great for working out in. If you are like myself and workout on a regular basis, it may be a good idea to get an extra pair specifically dedicated to your workouts. This will help limit the wear and tear on your general athletic shoes. 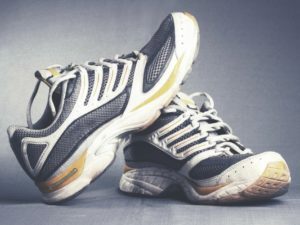 In addition, keeping a dedicated pair of athletic shoes will keep any permanent odors due to perspiration on those shoes and not your regular walking shoes. With your athletic shoes for home and other leisure activities, your dress shoes cover the opposite spectrum: business attire. These are pretty self-explanatory and realistically only have one purpose, but it is a very important purpose. Especially if you highly value your professional career. Wearing dress shoes to the office every day is a must if you want to get ahead and be successful. Dress shoes are a must for any formal occasion. For the truly fashion-savvy professionals, multiple dress shoes in different colors for different suits is ideal. But in most cases, you can just have a single pair of either black or dark brown shoes that work well enough with most ensembles. 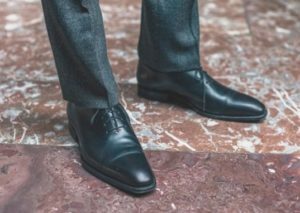 A nice peripheral benefit for those who are naturally short is the fact that dress shoes typically come with very thick heels. This means that they can instantly add 2 inches to your height. If you need to go on a date and need to impress (especially on a first date) you can’t go wrong going with a formal look with dress shoes. 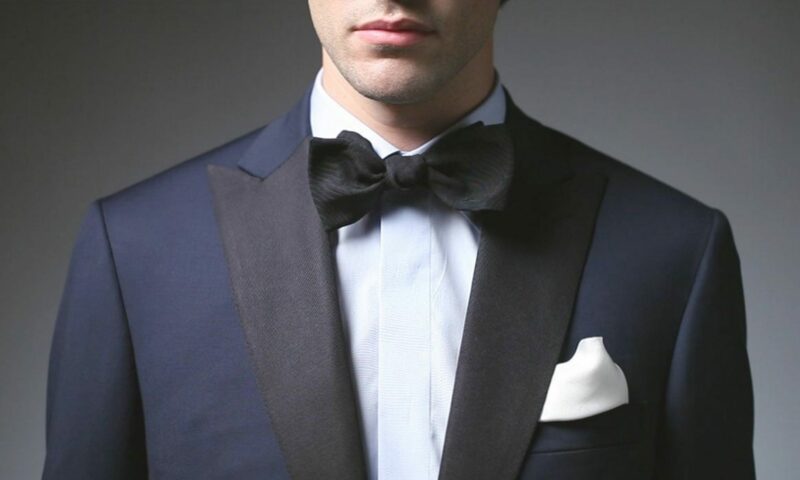 Not only do you look sophisticated and well-dressed, but you also naturally look taller as well! These shoes are more commonly known as boat shoes. They have a very simple design, with a very flat profile and thick shoelaces that are more fashionable than functional. And they slip on and off easily – in this sense it provides a convenient way to take the shoes on and off, while still remaining semi-formal. I personally like to use these shoes for casual outings and other social gatherings. 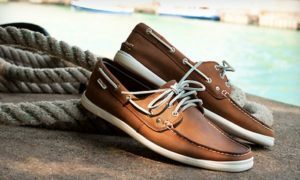 Boat shoes are not as formal as dress shoes, which is why they are recognized as “semi-formal” shoes. Depending on what kind of lifestyle you lead, you may not use these shoes as much as others. However, the huge difference between athletic shoes and formal dress shoes almost forces the need for an alternative shoe option when neither of those shoes are appropriate for the situation. In other words, these shoes work as a nice middle ground between the overly formal dress shoes and the overly casual athletic shoes. That necessity coupled with a unique and distinctive look from a fashion standpoint are why we recommend owning at least one pair of this shoe type. 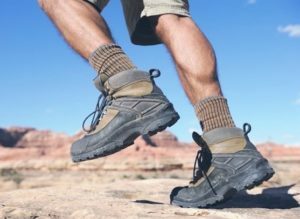 These shoes are sturdy yet functional when participating in mild activity such as hiking and other activities in the great outdoors. They are distinguishable by their high tops and thick and sturdy material (often it is leather). If you really want high-quality boots, you can get ones that are waterproof as well. Hiking boots are great for hiking (naturally), along with when you need well-built shoes for Do-It-Yourself projects. And the wonderful thing about these boots are that they also double as boots to wear when you have Do It Yourself projects at home. So even if you aren’t an avid hiker, these boots may find some use to you if you need to build things often. If you plan on using your boots for this, finding steel toed boots may be of use for you, depending on what type of home projects you typically work on. I surprisingly started fixing more and more things around the home by myself a few years back, which led me to go out and purchase a pair of high-quality Timberland boots. They are actually really comfortable and feel absolutely safe and secure for when I’m working with power tools and the like. Also note that out of all of the shoe types mentioned, these are the ones that will most likely last the longest, assuming you treat them well, so be sure to invest appropriately in these boots depending on what kind of mileage you are planning to get out of them. A wide range of shoes for all occasions! As you can see, there are many types of shoes available for purchase, each with their own applications and advantages. Athletic shoes are your all-purpose shoes for more leisurely activities in addition to being your workout shoes. Dress shoes are critical if you work in the corporate sphere and for high-profile formal events. Semi-formal shoes act as a nice middle ground between athletic shoes and dress shoes. And hiking boots are great for people who love the outdoors, or people who work on home projects often. Although each of these shoe types are unique in their own way, some of them may not be as necessary your specific lifestyle. However, if your budget allows for having such an extensive shoe collection, it would suit you well have at least one of each of these types of shoes.